Want to Swim with Humpback Whales? Now You Can in Byron Bay! You are here:Home » Blog » Byron Bay Activities » Want to Swim with Humpback Whales? Now You Can in Byron Bay! If you’re a big fan of whales, then you’ve probably visited Byron Bay to do whale watching at some point. You can grab a front row seat for viewing these amazing animals during the winter and spring, typically from June to November. Not only can you hang out at some excellent vantage points to catch views of the whales, but there are also a number of whale watching tours. But imagine taking the tour one step further and actually getting in the water with these magnificent creatures? Wild Byron offers an intimate swimming with the whales experience. This special tour only allows four people maximum along with a guide in order to increase the chance that the whales will interact. The two and a half hour and time frame provides the chance to swim with whales if they appear interested and, if time permits, some diving at Julian Rocks. It will cost $150 per person to experience such a unique tour. Bryon Bay photographer Scott Wilson owns and operates Wild Byron with locations in Byron Bay and Tonga. Wilson has been doing whale swim tours in Tonga for three years now, and he has decided to offer them in Byron Bay as well. Unlike the Tonga one, which is a seven-day experience that includes dives every day, yoga, PADI Freediver course and certification and more, Byron Bay is operated more like a traditional tour. Masks, fins and wetsuit are even provided, but the tour page recommends bringing your own equipment if you have it. So you’ll want to keep in mind if you’re signing up for a tour that there’s no guarantee that you will actually swim with whales. However, if you’re really wanting to see whales, then it might be better to hop on the whale sighting tour run by Get Down Whale Watching, which runs daily at 10 am from Brunswick Heads boat harbour (weather permitting). This tour only allows 10 people maximum — so still an intimate group — and the company will provide a second trip for free if you don’t see whales on your tour. There’s also a likelihood that you’ll get a chance to view other animals like dolphins, turtles and seabirds. The cost of the tour is $89 per person. Doing something as unique and memorable as swimming with whales doesn’t come without a price tag. The good news is you can come to Byron Bay and stay in an affordable accommodation. 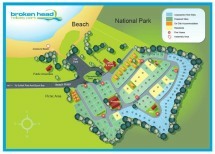 Broken Head Holiday Park offers non-powered and powered campsites as well as beach shacks and cabins. You’re sure to find a suitable place to stay and then you’re ready to start planning your “whale” of a holiday!